01: VISIT TO CHANCOLÍN CENTRO AND TO OJO DE AGUA SAN RAMÓN, BARILLAS, HUEHUETENANGO. On the first of April, Monsignor Eduardo continued his visit to the communities of the municipality of Barillas in Huehuetenango. 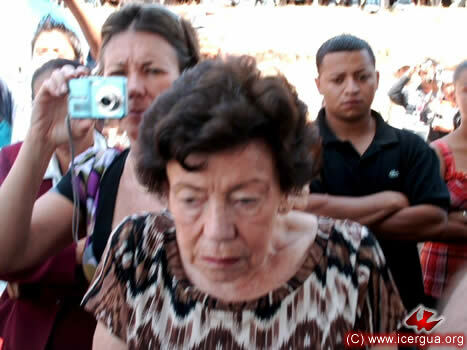 The first visit was to the Community of Central Chancolín. In Chancolín there are two communities. 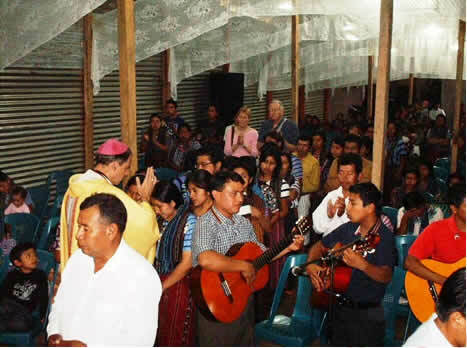 During the celebration the bishop was able to observe the significant progress made in constructing the church building. He celebrated three baptisms and twenty-four confirmations. In addition there were some First Communions. The growth of the community is noteworthy. Quite a few families have joined just since the first of this year. Above: The ceremony for the absolution of sins. Right: One of the several baptisms in the community. Left: At the end of the confirmation ceremony, the sponsors pray for their charges. 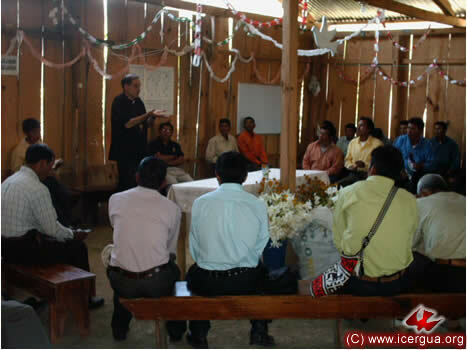 Right: The community of Ojo de Agua, San Ramón, was the bishop’s second stop. The community had prepared a splendid reception for the bishop, and had decorated the church splendidly. During the Mass several baptisms and confirmations were celebrated. is preparing to accompany the congregational singing. Left: The ceremony of Recon-ciliation. 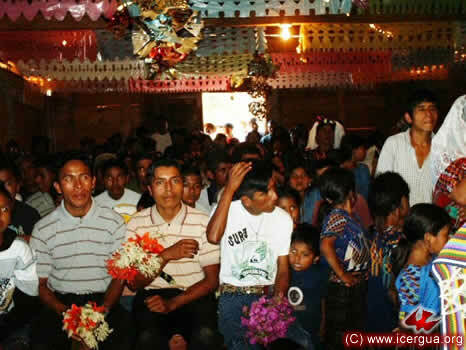 02: CONFIRMATIONS AND WEDDINGS IN ILOM, CHAJUL, QUICHÉ. For pastoral reasons, certain communities of our Church celebrate the passion and death of Christ with the Mass of the Holy Cross on Good Friday. 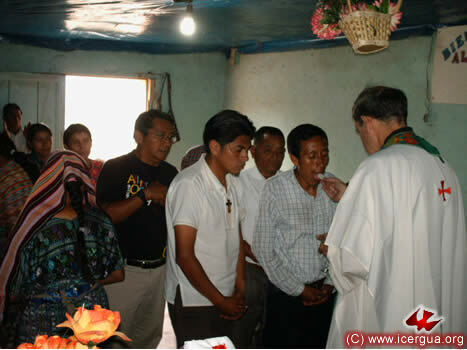 This was the case in the Ilom Community in Chajul, El Quiché, which, on the occasion of the bishop’s visit, had prepared twenty-five confirmations and two marriages of couples who had received the sacrament of Confirmation in the same ceremony. In Ilom 90% of the Catholics are Renewed Catholics. Above: The church completely filled with cut-paper decorations. On the front rows are the faithful who will receive the sacrament of Confirmation. Right: The two couples who have married. 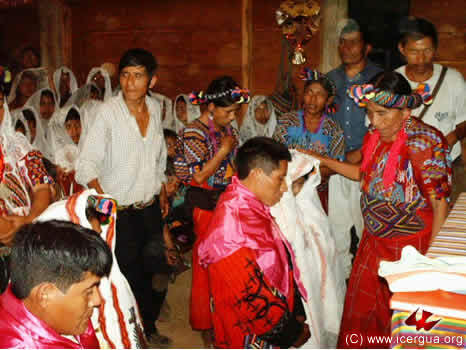 After being adorned with new attire that, according to the custom of the area, are given to those who marry, they receive the blessing of their parents and sponsors. 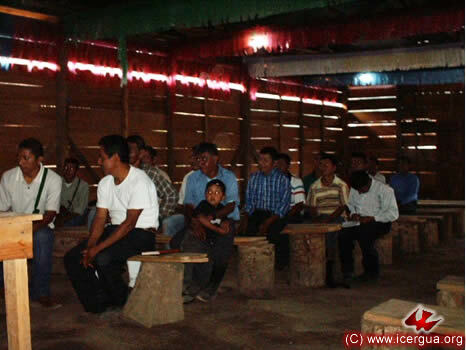 02: MASS IN TZOTZIL, CHAJUL, QUICHÉ. 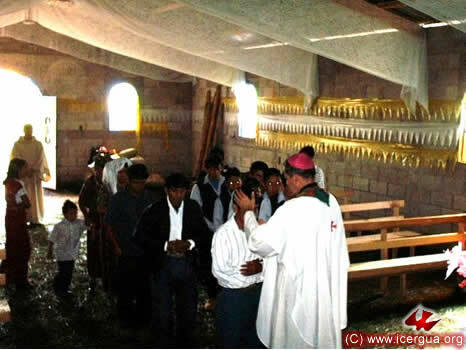 At midday on Good Friday, Monsignor Eduardo celebrated the Eucharist of the Holy Cross in the Community of Tzotzil, Chajul. Three children were baptized. 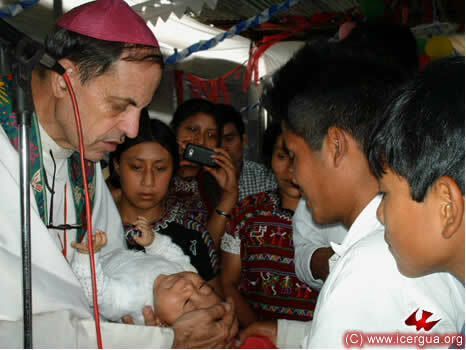 Left: the bishop baptizing one of the children. 02: DEANERY OF QUICHE NORTH II IN CHAJUL. During Good Friday afternoon Section Two of the Deanery of North Quiché met for the first time in Chel. 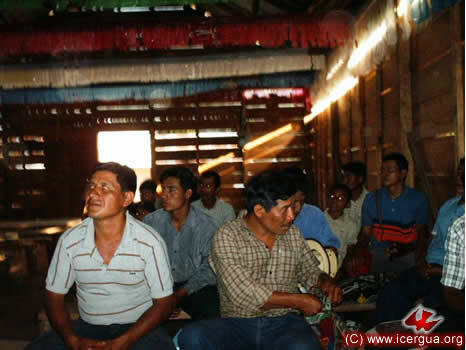 Present were representatives of the communities that form the Parish of the Faith of the Blessed Martyrs of Chajul. Some communities of Nebaj also meet with this section of the Deanery as it is more easily accessible for them. 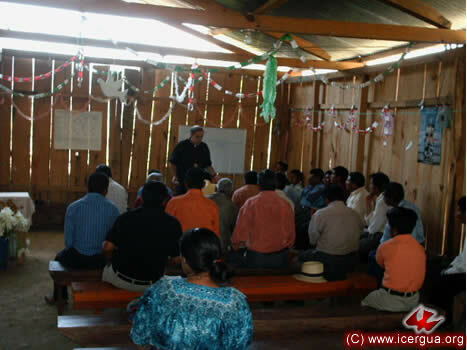 The meetings of the Deanery alternate between the parish seats of Chel and Ilom. Above and left: The participants at the Deanery meeting. Eucharist was celebrated in the Chel Community on Good Friday evening. This community continues to grow. Recently four new families have joined it. Now its commitment is to consolidate the two communities that are coming into being in Covadonga and Estrella Polar. 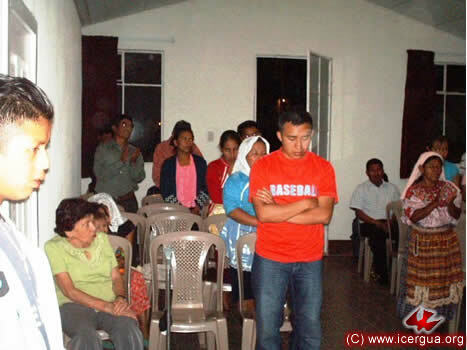 Right: Prayer after receiving communion. 03: DEANERY OF QUICHE NORTH I, IN NEBAJ, QUICHE. On Holy Saturday morning, the Deanery of Section One of North Quiché , which comprises the twelve communities of the municipality of Nebaj, had its meeting. After clearing up some doubts, the participants shared in the specific instruction that Monsignor Eduardo had prepared. It dealt with awareness of the sacramental reality of the church and how the one, holy, catholic apostolic church makes itself present in each of the small communities, especially through the celebration of the Eucharist and the missionary commitment that each community ought to taken on. 03: MASS IN SUMALITO, NEBAJ, QUICHÉ. 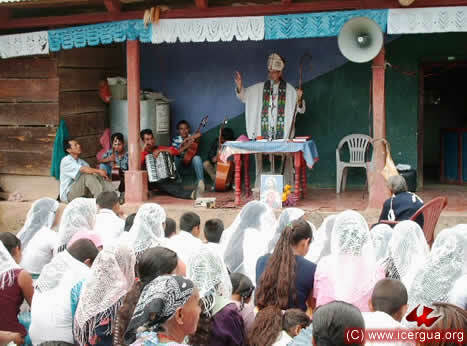 During the afternoon of Holy Saturday, the bishop began the celebration of the ceremonies of the Resurrection in the Sumalito Community, in the northern part of Nebaj. The Liturgy of the Resurrection of the Lord was celebrated, and, in the context of the ceremony, the sacrament of Baptism was administered to several of the faithful, incorporating them into the community. Left: The community, joyous and attentive, participating in congratulating those who have been baptized. 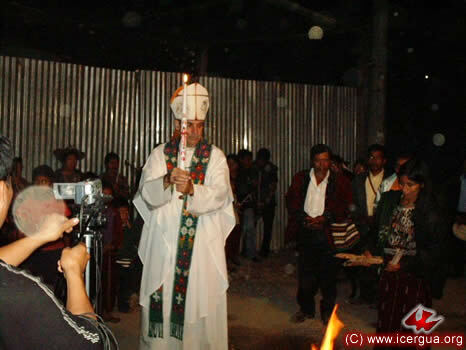 03: PASCHAL VIGIL WITH THE COMMUNITIES OF DOWNTOWN NEBAJ, QUICHÉ. 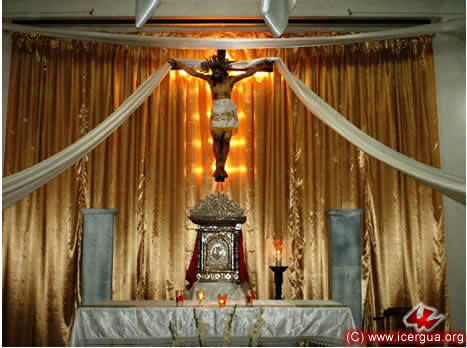 During the night of Holy Saturday in the city of Nebaj and with the participation of delegates from the four Renewed Catholic communities of the city, the solemn vigil of the Resurrection was celebrated in the community hall of the local TV Channel 15, which transmitted the ceremony live. The ceremony began outside with the blessing of the paschal fire and the lighting of the candle, symbolizing that Christ has truly been resurrected and lives with us. and making the Easter proclamation. 04: EUCHARIST IN PARRAMOS GRANDE NEBAJ. 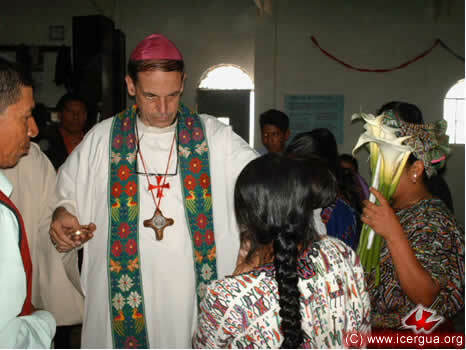 The bishop’s first visit on the Day of Resurrection was in the Parramos Grande Commuity, located in the mountains that go on to the Cuchumatanes. To get to the Mass it was necessary to make a long walk. It was a beautiful walk, in which one could enjoy the beauty of nature. 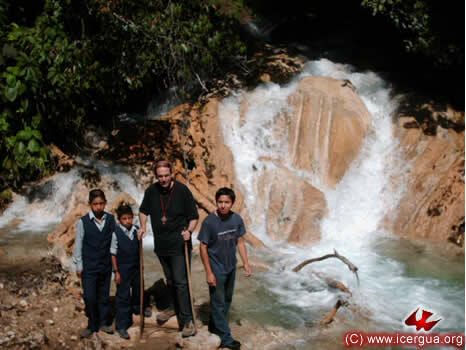 Throughout the walk one is accompanied by brooks and waterfalls that come from the Cuchumatanes and form the Chel River. Recently the Parramos Grande Community completed construction of the walls and roof of its church, the fruit of much labor. Now, along with evangelization, it intends to continue the work on the church and give it its finishing touches. Above: The walk. The bishop is accompanied by seminarian José, who was with him as acolyte for all of Holy Week. The bishop was also joined by two children from the community, sent to receive and accompany the group. Right: The Liturgy of Reconciliation. In the back is seminarian Marco Tulio. 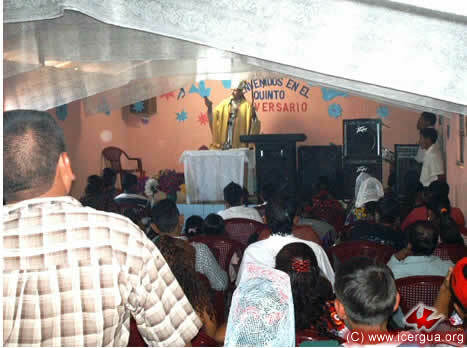 04: MASSES WITH THE COMMUNITIES OF SALQUIL GRANDE, NEBAJ. 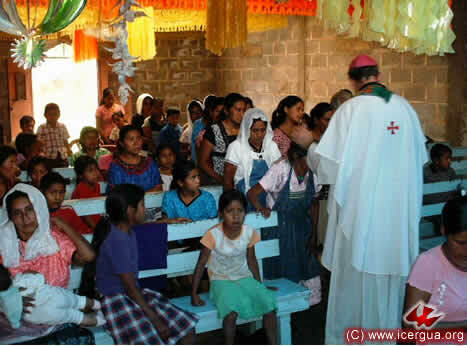 At the end of Easter morning, Bishop Eduardo visited the central community of Salquil Grande. On this occasion the sacrament of Baptism was ministered to a group of children within the celebration of the Eucharist. After midday Monsignor Eduardo made his first visit to the new community of “Los Nuevos Apostentos,” also in Salquil Grande. It is a very active, quickly growing community. During the Eucharist, several baptisms were celebrated. 04: EUCHARIST AT CHEMAMATZÉ, NEBAJ. During the afternoon of Easter Sunday the bishop celebrated with the community Chemamatzé, one of the neighborhoods in the city of Nebaj. Baptisms were celebrated, and the bishop took advantage of his visit to encourage the whole community to commit itself to active evangelism. 05: DEANERY OF CENTRAL QUICHE II IN USPANTAN, QUICHE. On Easter Monday a transcendental meeting of Section Two of the Deanery of Central Quiché took place. During January a serious problem came up in Uspantán. Some of the leaders had left the Catholic faith and tried to persuade the People of God to follow them. The sense of faith grasped by the People of God, like that of the Christians of the first centuries, rose above the erring persuasions of those leaders. In this way the great majority of the brothers and sisters persevered in the Catholic Faith. On Easter Monday the election of the Parish Council took place, which is charged to coordinate the life of the parish and continue working to preserve the faith. 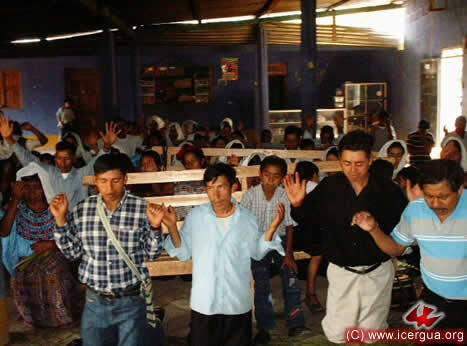 05: MASSES WITH THE COMMUNITIES OF: LAS ANONAS, ZONA 4 AND JACUBÍ, USPANTÁN. In the photograph above: Our bishop, Monsignor Eduardo, Brother Julián Bal, consultant for Uspantán, Father Bernabé, who is responsible for pastoral care in this area, as well as numerous brothers and sisters attended the Deanery meeting. Left: After the meeting of the Deanery, Eucharist was celebrated for the members of the Council. 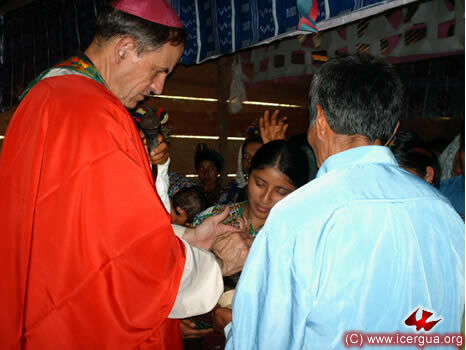 In the photograph: Monsignor Eduardo giving communion to the President of the Council, Brother Pablo from Las Anonas, Chicamán. During the afternoon, Monsignor Eduardo made his first visit to the community of Las Anonas Chicamán. 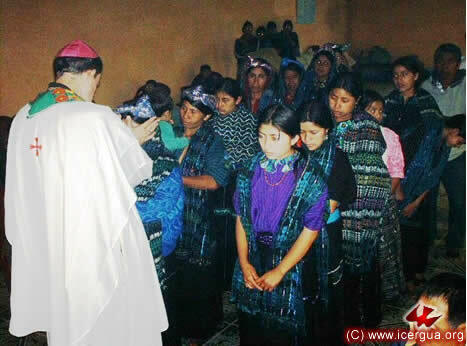 Although it is located in the municipality of Chicamán, it participates religiously in the Uspantán Parish of the Most Holy Trinity. 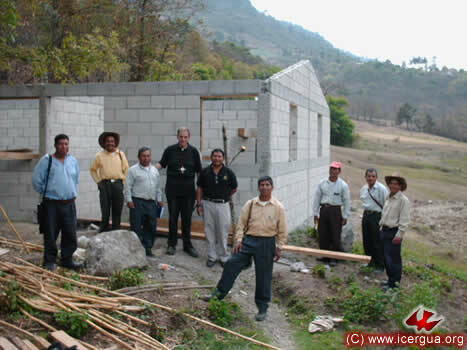 After great efforts, the faithful have completed a significant phase in the construction of their church building. During the evening, Monsignor Eduardo celebrated Eucharist with the community of Jacubí, located in the urban area of the municipality of Uspantán. The faithful were especially joyous, for it was the first time the bishop celebrated in their recently built church. Above: Monsignor, at the beginning of the Mass. With him are Deacon Denis, a member of the formation team from the Seminary, who did pastoral work during Easter week in Uspantán, and seminarian José, who went with the bishop during all the pastoral work of Holy Week. 06: DEANERY OF CENTRAL QUICHE I IN CUNEN, QUICHE. On Tuesday, April 6, Monsignor presided at the celebratiuon of the Deanery of Central Quiché, Section One, the Cunén house of prayer. 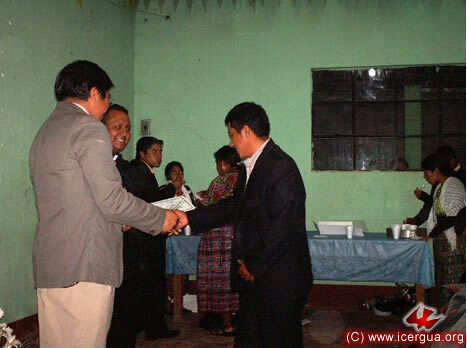 The lieaders of Cun´n and representatives of the communities of Sacapulas and of San Pedro Jocopilas. The meeting was very lively. They evaluated their progress. 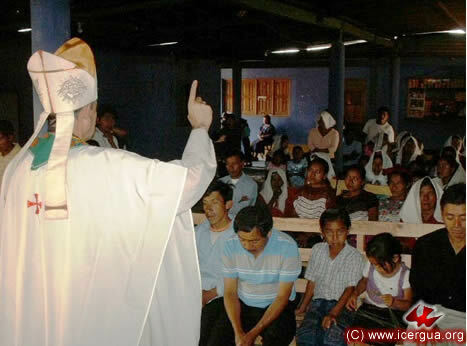 The faithful indicated their satisfaction with the pastoral work of Father Bernabé and the bishop gave them extensive instruction about different aspects of the church. Right: the bishop explaining concepts of ecclesiology during the time of instruction. 06: VISIT TO THE CONSTRUCTION OF THE PRESTS' RESIDENCE IN CUNEN, QUICHE. When the Deanery meeting was over, the bishop and the directors of the Cunén church inspected the progress of the construction of the Deanery offices which will serve temporarily as the residence of the presbyters who are tending to the pastoral needs of the area. The work is well along, and it is hoped that the construction will be finished in the middle of June. Above: The beautiful property owned by the Cunén church. The construction work can be seen in the background. Right: Monsignor Eduardo and Father Bernabé with the leadership of the Cunén church. 06: MASS IN PUENTE CHUATUJ, SACAPULAS, QUICHÉ. During the afternoon of April 6, Monsignor Eduardo presided at the Eucharist in the Puente Chuatuj, Sacapulas, Community. This community is determined to build its own house of prayer. It has purchased a property at the edge of the highway and is completing arrangements for beginning construction. The community knows how to join strong spirituality with great dynamism. As result, it has grown steadily. Above: The Sacrament of Reconciliation. 11: EUCHARIST FOR THE RECOVERY OF DOÑA ANNA, OUR BISHOP'S MOTHER. 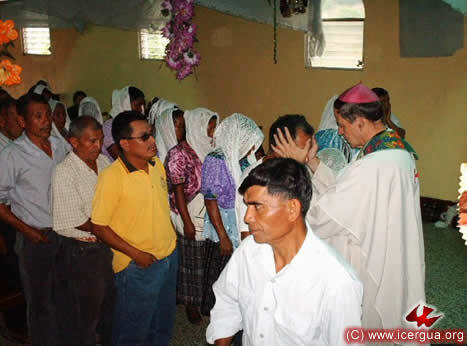 The mother of our bishop, Doña Anna, accompanied him to Huehuetenango for the Holy Week Mission. In view of her age, she stayed in the Formation Center in the departmental capital and the bishop made frequent trips to be with her. On Easter Sunday she began to suffer serious health problems, and on Tuesday night she felt abdominal pain. On returning from the mission on Easter Wednesday, she had to be hospitalized, for she was suffering from acute peritonitis. The seriousness of her situation made the bishop cancel the visit he had planned to the Los Angeles, California, mission. To pray for her health, on Sunday, April 11, the bishop in the company of his whole family celebrated Eucharist in the Hospital of the Americas, where she was hospitalized. 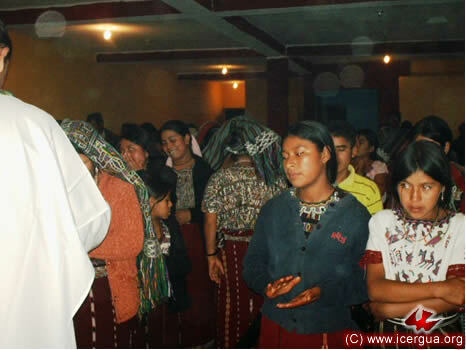 Above: Photograph of Doña Anna taken on October 27, 2009, when she participated in the ordinations and the anniversary of the Church in the Formation Center in Huehuetenango. 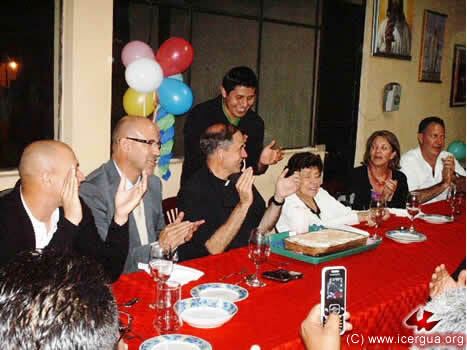 Right: Photograph from March 4, when the seminary joined around a meal to celebrate the Monsignor’s birthday. From left to right: Julio Madrid, assistant to Gerardo Aguirre; Gerardo, Monsignor’s Eduardo’s brother, the Monsignor, Father Juan Moisés Mendoza, educator, Doña Anna, Ileana and Federico, the bishop’s sister and brother. Monsignor Eduardo celebrated in the Formation Center for the students of ESTYMLA, which was holding instruction sessions that weekend. 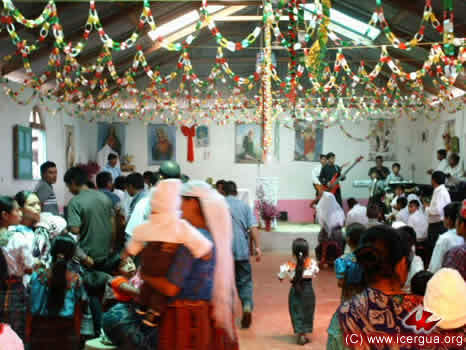 16: ANNIVERSARY CELEBRATION IN CHUITZANCHAJ AND MASS IN PAJOMEL, SANTA CRUZ LA LAGUNA. 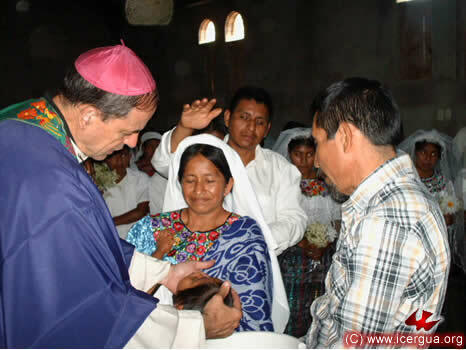 On Friday, April 16, Monsignor celebrated the monthly Eucharist with the community of Pajomel, Santa Cruz La Laguna, Sololá. As always, the community was very lively. It was preparing for its anniversary celebration, which will take place on May 1. 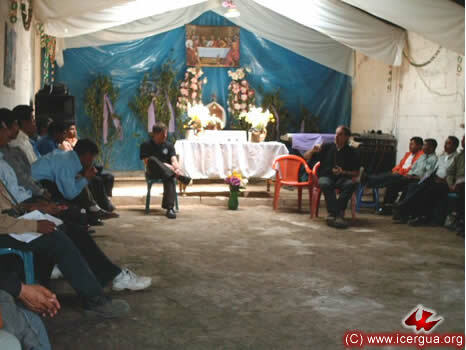 After the celebration at Pajomel, Mosignor presided at the Eucharist in the Community of Chuitzanchaj, Santa Cruz La Laguna. On that occasion four children received baptism and, as has happened more or less regularly in recent times, a new family made its profession of faith and was incorporated into the community. With that celebration the community began to celebrate its anniversary. On Saturday the faithful spent the whole day in praise and prayer. 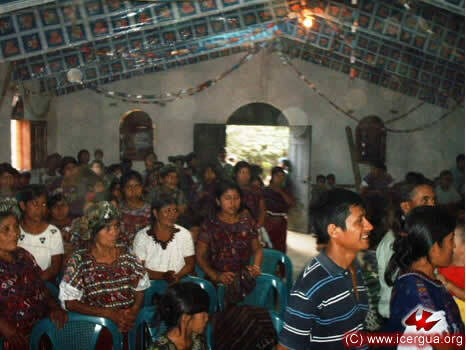 Faithful from other communities of Sololá also participated. Above: Administering the Sacrament of Reconciliation. Left: The celebration of baptism. 17: VISIT TO PAJALES, SAN ANTONIO HUISTA, HUEHUETENANGO. 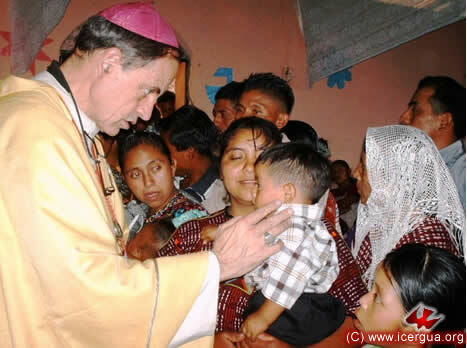 On Saturday, April 17, our bishop visited the community of Los Pajales, San Antonio Huista, Huehuetenango. On that occasion eight families coming from another church felt called to profess the Catholic faith and were admitted into the community. After they made their confession of faith, the community prayed for their perseverance and growth in the faith. 17: VISIT TO LA NUEVA ESPERANZA, LA DEMOCRACIA, HUEHUETENANGO. During the afternoon, Monsignor Eduardo visited the Community of La Nueva Esperanza in the municipality of La Democracia. 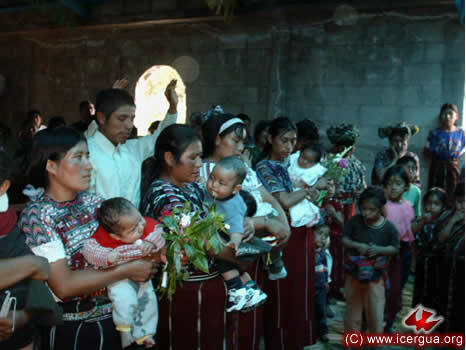 There, besides the celebration of the Eucharist, several baptisms were celebrated. Continuing to be strong, the community joyously reported the incorporation of another two communities in the neighboring areas. 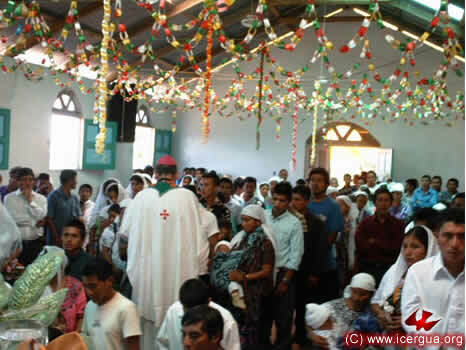 17: EUCHARIST IN LA VEGA, LA LIBERTAD, HUEHUETENANGO. 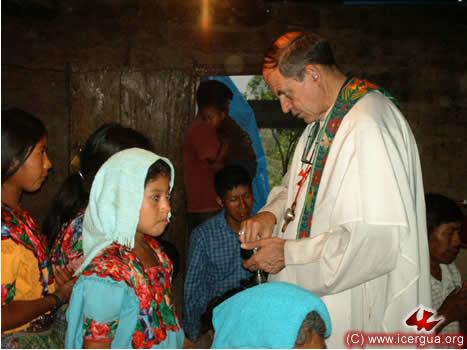 In late afternoon, Monsignor Eduardo presided at the Eucharist in the La Vega Community, located above the Panamerican Highway, close to the place known as El Boquerón. In view of the fact that the Communion Minister he been absent for several months for health reasons, the community elected Brother Fidel, leader of the community, as the Communion Minister. Above: The bishop administering the sacrament of Reconciliation to the faithful. Left: Brother Rogelio, leader of the Renewed Catholic communities of La Democracia, prays for Brother Fidel after he was installed as Communion Minister. 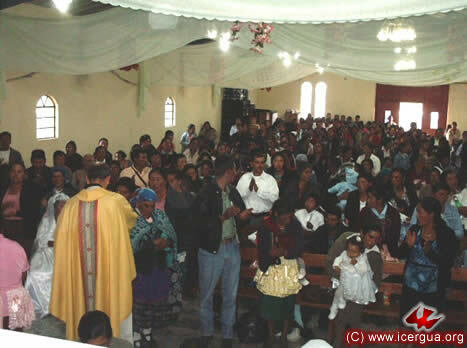 18: MASS IN WUICÁ, LA LIBERTAD, HUEHUETENANGO. 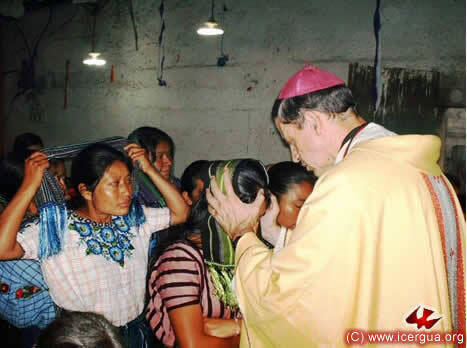 On the eighteenth during the morning, the Monsignor went for the first time to the Community of Wuicá in the municipality of La Libertad, Huehuetenango. Fourteen baptisms, sixteen confirmations as well as some First Communions had been prepared. Although this community only has a church building under construction, its enthusiasm is significant, and, according to its members, its growth is accelerating. Above: View of those who are about to be confirmed and make First Communion, and some others of the brotherhood. Right: Monsignor Eduardo delivering the homily. 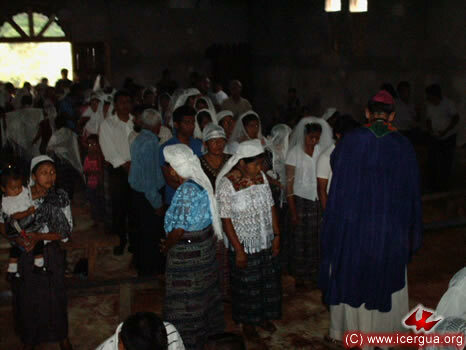 18: MASS IN SIPAL, SAN SEBASTIÁN H., HUEHUETENANGO. On the afternoon of Sunday the eighteenth, the bishop presided at the Eucharist in Sipal, San Sebastián H. On the occasion, the leader of the communities, Manuel Sales, wanted to give thanks to God for all the blessings received, the day being his birthday. Brother Manuel has great projects that he hopes to carry out to benefit evangelism after two years of serious health problems. Above: The prayer, invoking the Holy Spirit. 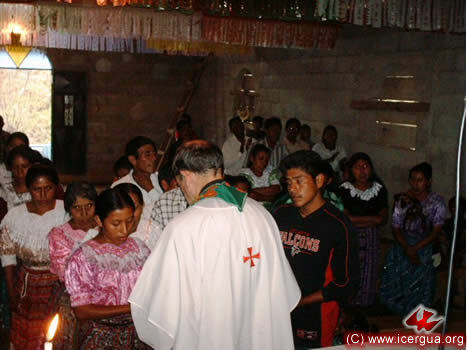 23: MASSES WITH THE CATHOLIC RENEWED COMMUNITIES OF SANTIAGO ATITLÁN. 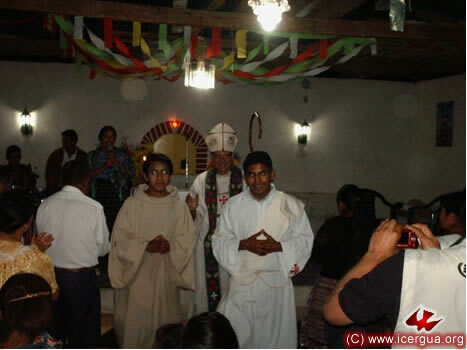 On Friday, April 23, Monsignor Eduardo visited the Renewed Catholic Communities of Santiago Atitlán. 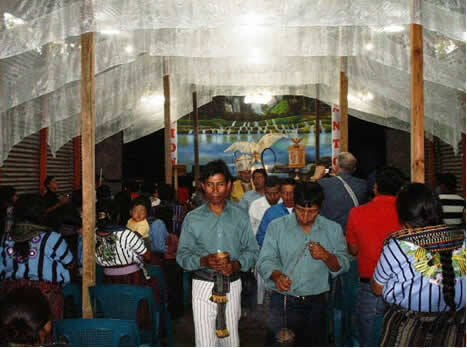 The first celebration was with the Community of the Efusión del Espíritu Santo. It has 850 members, of which 325 are adults. Above: The choir intones the Kyrie and the Gloria, as the bishop imparts absolution to each of the those who have confessed their sins. Right: The bishop blessing the people of God during the recessional. 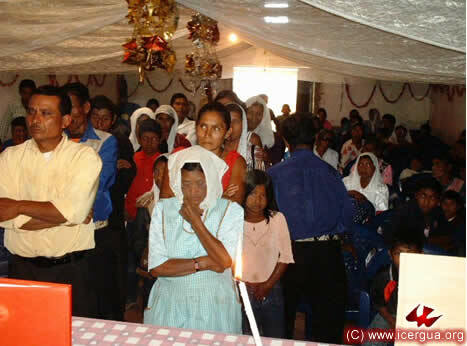 The Pentecostés Community has about 200 members. In the photograph at left: the absolution of those who have confessed their sins. 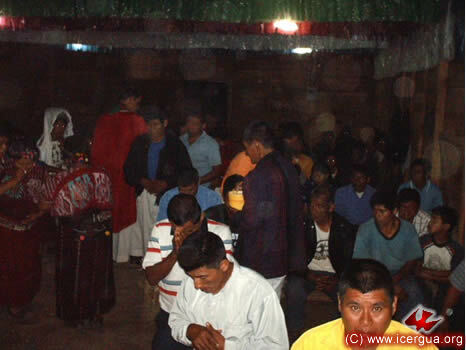 24: CELEBRATION IN IXBÁN, SAN PEDRO NECTA, HUEHUETENANGO. 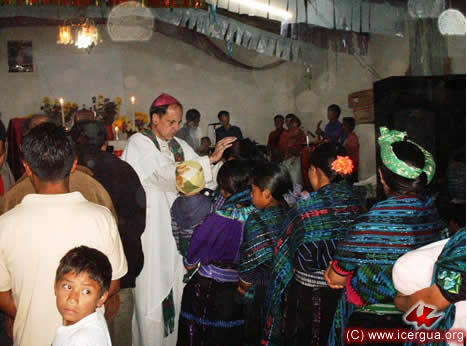 On the afternoon Saturday, April 24, the bishop presided at the Eucharist with the community of Ixbán, San Pedro Necta, which was celebrating its fifth anniversary. 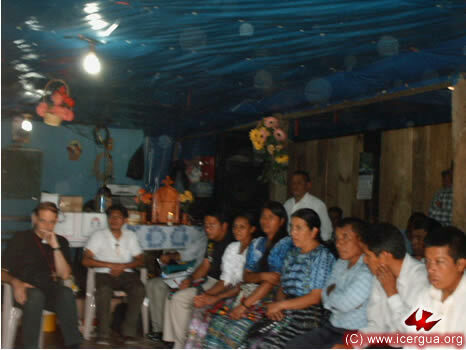 Five baptisms and a marriage were celebrated during the visit. Left: Prayer over one of the children who was to be baptized. 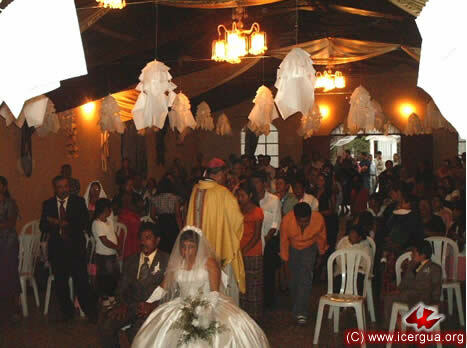 24: WEDDING AND MASS IN CHINACÁ, HUEHUETENANGO. 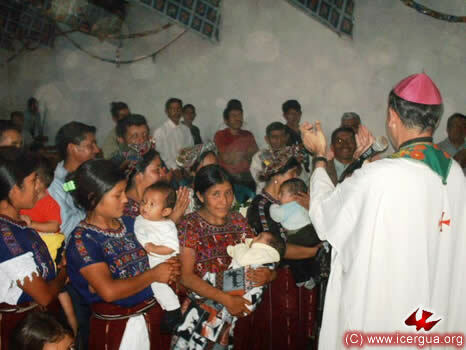 In the evening of the twenty-fourth, Monsignor Eduardo presided at the Eucharist in the Chinacá, Huehuetenango, Community, during which there took place the marriage of Brother Ángel, one of the communion ministers serving the community, and a National Civil Police officer. 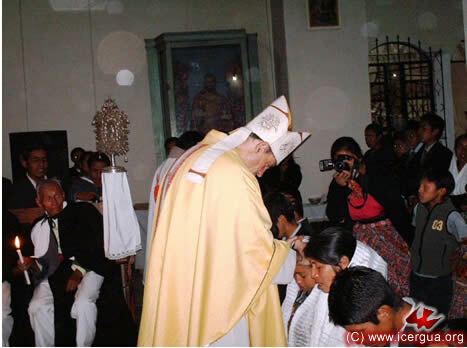 In the photograph at left, the couple can be seen just after receiving absolution, while the bishop is imparting absolution to the other participants in the ceremony. 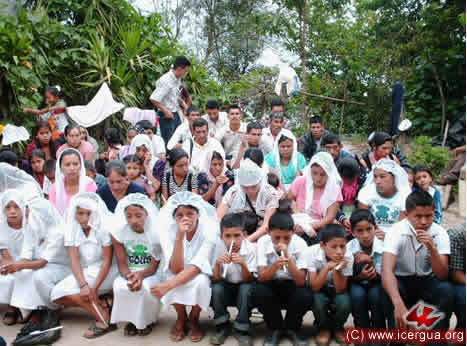 25: EUCHARIST IN LA CAPELLANÍA, CHIANTLA, HUEHUETENANGO. 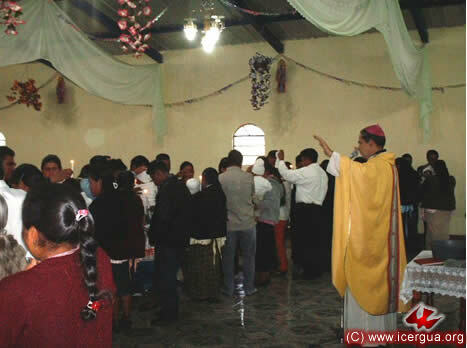 On Sunday morning, April 25, the bishop celebrated the Eucharist in the community of La Capellanía, Chiantla, in the presence of more than a thousand faithful. 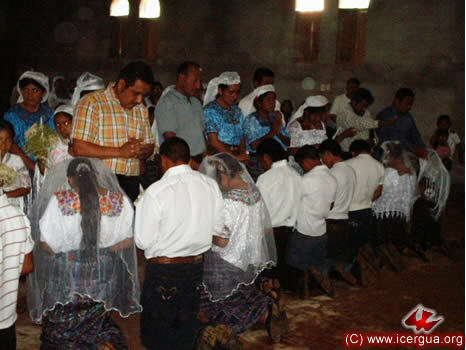 Thirteen children were baptized and a marriage was celebrated. 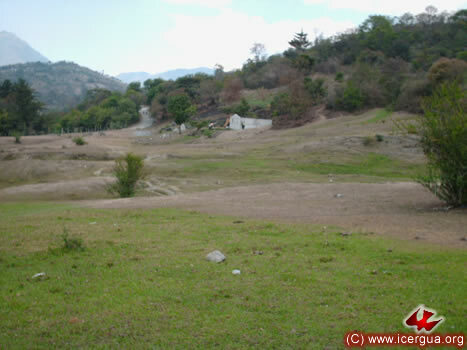 This community, like several of the seventeen communities in the municipality of Chiantla, Huehuetenango, is experiencing an increased rate of growth. About three years ago, they constructed a large church with the idea that it would serve to gather together all the faithful in the communities of the municipality. Today, it is large enough only for the members of the one community. Above: The celebration of baptism. Right: The newly weds participating in communion. 25: BLESSING OF 33 NEW CATHEQUISTS AND MASS AT ST. JOHN'S CATHEDRAL, COMALAPA. 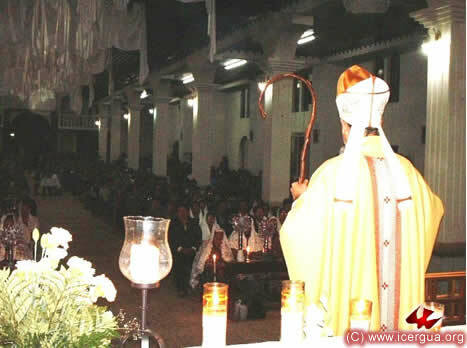 During the evening of April 25, the bishop presided at the Eucharist in the Holy Cathedral of San Juan Comalapa. It was the occasion for installing thirty-three catechists who, after several years of instruction had completed their training. The faithful filled the cathedral to overflowing. Above: The cathedral during the homily. Right: Prayer over the catechetical instructors who were installed. After the Eucharist, a love feast was celebrated with the thirty-three new catechists. During it, a diploma of recognition was presented to each one for having completed their formation. The distribution of the diplomas was done by Fathers Francisco and Rigoberto, who in addition to being responsible for the pastoral care of the community also gave the catechetical training every Wednesday for several years.